With every fitness regimen the body is used in different ways. Some workouts require power and strength; others require endurance and resistance; still others require flexibility and mobility. While it’s important to know how muscles function and adapt during exercise, understanding your breathing is another powerful factor that can make or break your workouts. Breath control is an effective tool to help workouts reach their full potential. By utilizing breath properly, you can steadily improve performance in any discipline. Regardless of the fitness type – whether yoga, running, cycling, or lifting weights – proper breathing can help the body adapt to the various challenges that arise when exercising. Just as different muscles are used during different types of training, certain breathing techniques better apply to different workouts. Here are some specific breathing exercises to complement your workout regimen. Breath awareness lies at the core of any yoga practice. Breathing techniques vary depending on the style of yoga being practiced. They fall into two basic categories: the relaxation breath and the active breath. 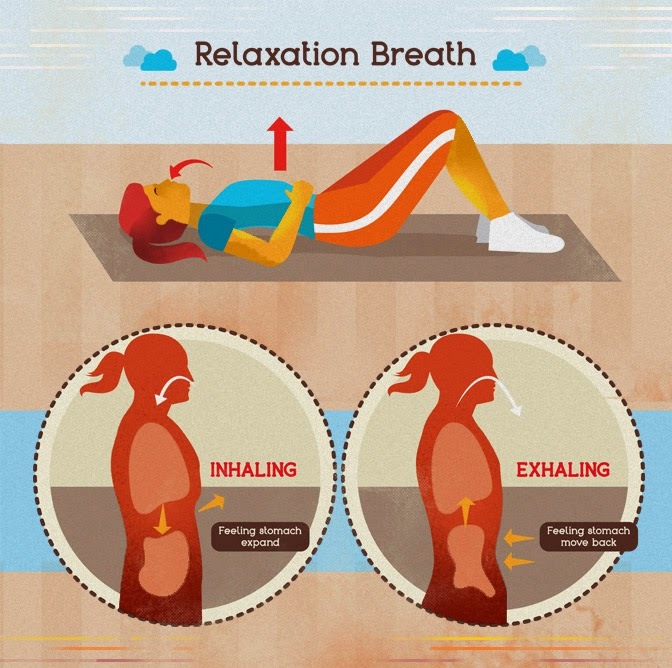 In general, if a yoga class is gentle or restorative, it is appropriate to employ the relaxation breath. For a more vigorous class (like a vinyasa flow or power yoga), utilize the active breathing technique. In yoga, students are encouraged to breathe in and out through the nostrils. This is the breathing technique that is closest to a natural breathing rhythm. When inhaling, imagine the belly filling with breath (hence the term belly breathing). Then when exhaling, allow the exhalation to be long and slow. If the inhalation is a four- or five-count, for example, the exhalation should be a five- or six-count. This breathing technique is best learned while lying down, because the body is able to completely relax when in a supine position. As a result, there are no restrictions or physical tensions to inhibit deep breathing. Once the relaxation breath is mastered lying down, it’s easier to practice it in a seated position. While practicing gentle or restorative yoga, this breathing technique helps maintain focus on relaxation. If you start to hold the breath or feel breathing become labored, return to the relaxation breath and allow the body to adapt accordingly. This breathing technique involves the deepest abdominal muscle, the transverse abdominus, and the pelvic floor muscles. The transverse abdominus wraps around the torso like a thick seatbelt and engages, along with the pelvic floor muscles, as the major player in a full, active exhalation. There are additional muscles at work, such as the spinal muscles and other abdominal muscles, but the transverse abdominus and pelvic floor muscles are the most important in facilitating an active breath. When inhaling, envision breathing into the lower belly, the ribs, and the chest. During the exhalation, draw up the pelvic floor muscles, engage the transverse abdominus (imagine a thick seatbelt tightening around the torso,) and push the remaining breath out of the body. Since the transverse abdominus and the pelvic floor muscles are key stabilizers for the spine and pelvis, utilizing this breath during a vigorous yoga class helps maintain a stable body when moving through the postures. The active breath assists with the development of a strong core, supports each movement, and keeps the focus on the body during yoga practice. Running and cycling encompass a variety of workouts and intensity levels. Some workouts involve maintaining a steady pace, while others require speed or hill work. We’ve focused on two breathing techniques that apply to a steady-paced training session or to hill or speed training. 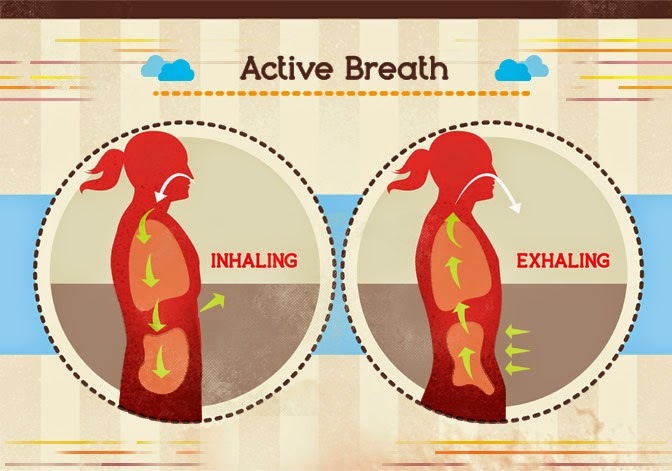 The steady counting breath is a technique that facilitates an even-paced breath. When inhaling, breathe in to the count of four (or five, or six) and then exhale for the same length of time. Aim for breaths that come in and out with relative ease. This breathing rhythm supports a steady running or cycling pace that corresponds with strides or cadence. When running, breathe in for two, three, or four paces, and exhale for the same number of paces. The same technique can be employed to maintain an even inhalation and exhalation on the bike. Controlled breathing keeps the heart rate down, which maximizes the ability to run or cycle efficiently. The counting breath helps to maintain a steady pace. By developing breath control in this manner, you can increase the breath count, or adapt it as necessary for each workout. Training on the road, a treadmill, or bike inevitably involves hill or speed work. These workouts can throw off pace, test breathing rhythm, and challenge muscles differently than training on flat surfaces. For these workouts, adapt the steady counting breath to focus on a slightly longer exhalation. The breathing count will naturally be shorter than a steady counting breath because of the demands these workouts place on the body. 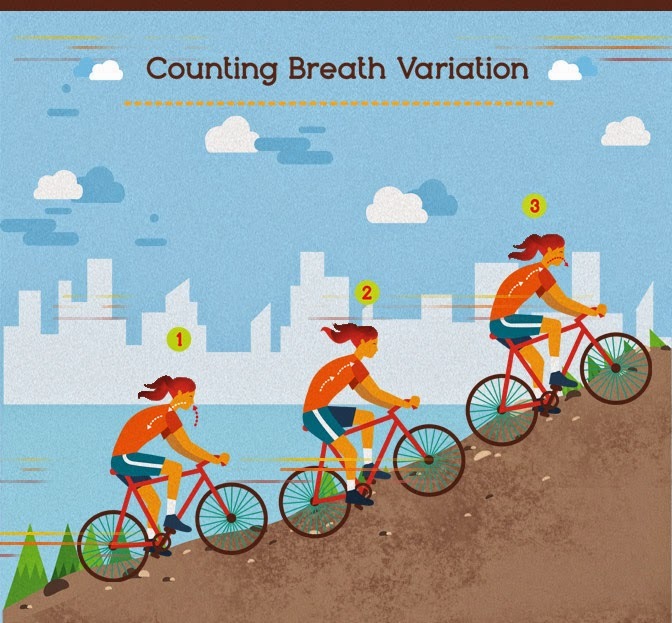 For the counting breath variation, breathe in for a count of one and breathe out forcefully for a count of two. Running or biking places the body in a position that allows an easy inhalation, but takes abdominal strength and breath control to manage exhalations. When this variation of the counting breath is practiced, the abdominal muscles are trained by controlling the exhalation more than the inhalation. 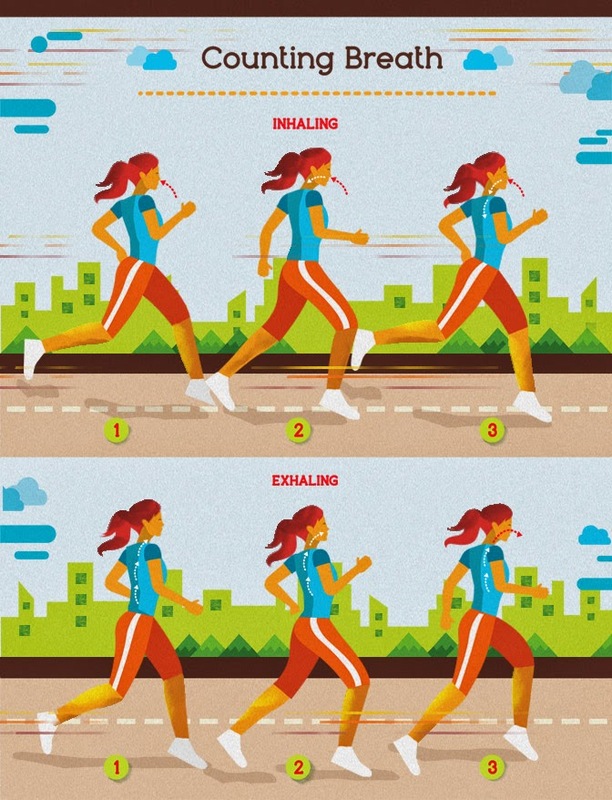 When running, for example, inhale for one stride, but focus on a two-stride exhalation. By concentrating on maintaining a breathing rhythm with a more powerful exhalation, which will vary according to the pitch of the hill or the pace of our speed work, we can use the breath as a constant source of energy to propel the body forward and get us up those hills. When lifting weights, the body needs power, stability, and focus. It is common for people to hold their breath when lifting. Unfortunately, holding the breath reduces potential strength, because the full energy of the core and breath doesn’t underlie each movement. This breathing technique will energize and power the body throughout your repetitions. 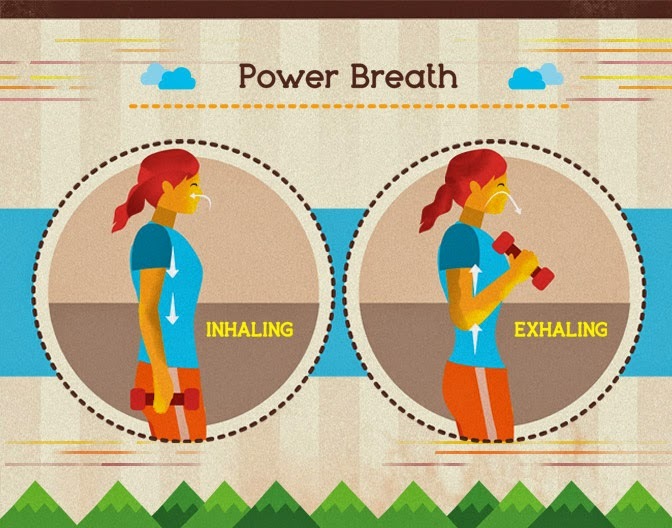 The power breath is a combination of the active breath described above in the yoga section and the counting breath variation, with a focus on exhalation described in the running/cycling section. To practice the power breath, inhale deeply and then pause at the end of the inhalation. During this pause in the breath, mentally prepare to lift the weight, be it dumbbells, kettlebell, barbell, or machine. With a powerful exhalation, engage the transverse abdominus and the pelvic floor muscles at the same time as lifting, pressing, or pulling the weight. By using the power breath – which involves core stability and a focus on long powerful exhalations – it’s possible to maintain a stable torso, which is essential for safe lifting. A stable torso also helps protect the spine and back by utilizing the core muscles to support a strong, balanced body. The power and focus of the exhalation energizes the muscles when lifting. Employing the relaxation breath between sets allows the muscles to relax and regain energy for the next set of repetitions. Regardless of the type of exercise, conscious breathing can give you a greater awareness of your body and its signals. It can help you recognize when you are not working hard enough or overexerting yourself. Whether it’s on the mat, on the trails, or at the gym, being in tune with your breathing for every inhale and exhale can enhance your workout.